under his own power in one day than Greg Kolodziejzyk. Calgary, Alberta... On September 9th, 2008 Calgarian Greg Kolodziejzyk set a *world record by pedaling his human powered boat 245.16 km (151.3 miles) in 24 hours on Whitefish Lake, Montana. 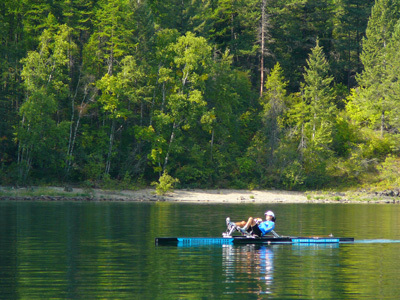 A 5.79 km circular course was marked with buoys and surveyed on Whitefish Lake in Montana. Greg started pedalling his human powered boat Critical Power 2 at 9:30 am on Monday, September 8th, and made continual loops around the course stopping only once for 2 minutes to put on some warm clothes for the night. 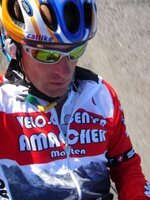 Greg received food and water from his support crew by a special telescopic rod so that he would not have to stop pedaling. At exactly 9:30 am on Tuesday morning as per the atomic clock that was used to time the event, Greg had finished 42 complete laps plus a partial lap equalling a total distance travelled of 245.16 km (151.3 miles) beating the old record of 241.8 km set by kayaker Carter Johnson in 2006 on a lake in California. 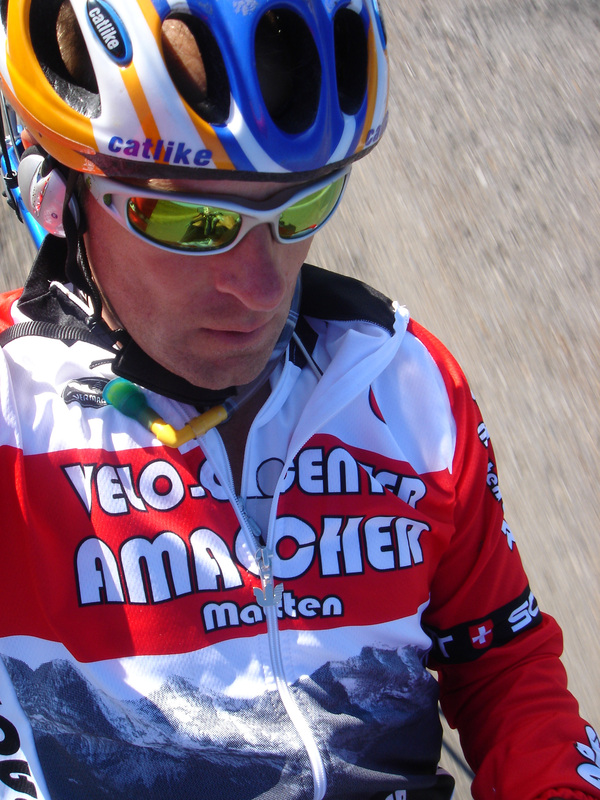 Official observers from the international human powered vehicle association were stationed at key points along the course to verify that Greg stayed to the outside of the markers, and traveled the full distance measured. 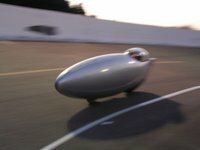 The record is unofficial until the International Human Powered Vehicle Association and Guinness World Records ratifies it. Critical Power 2 is considered to be the most efficient self-powered boat on the planet (over long distances). It will maintain a speed of 10 km / hr with an easy to moderate cycling pace. CP2 is a carbon fiber trimaran that was designed by human powe red boat expert Rick Willoughby from Brisbane, Australia, and built by Greg Kolodziejzyk. It's 24 foot long hull is only 9" wide, weighs less than 20 lbs and displaces only 4" of water. 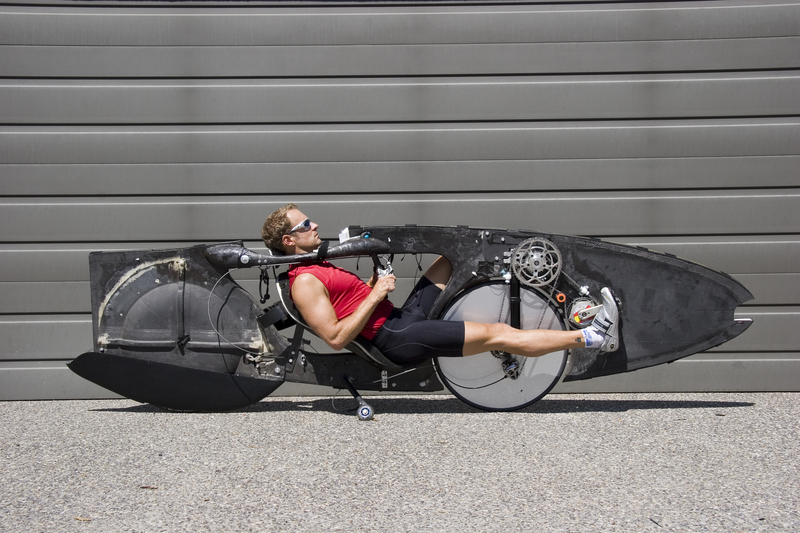 Greg is positioned in a recumbent seat mounted on the deck enabling a powerful pedalling position. The pedals turn a right angle gear box which spins a shaft leading to a propeller under the water. The main hull balances on the water by two small outrigger floats mounted to each side of the main hull. The entire boat weighs less than 40 lbs and it's top speed is 17 km / hr. 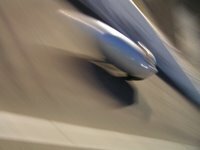 Greg is the fastest man on earth with a world record set in 2006 on a race track in California for the most distance covered by human power in 24 hours on land. 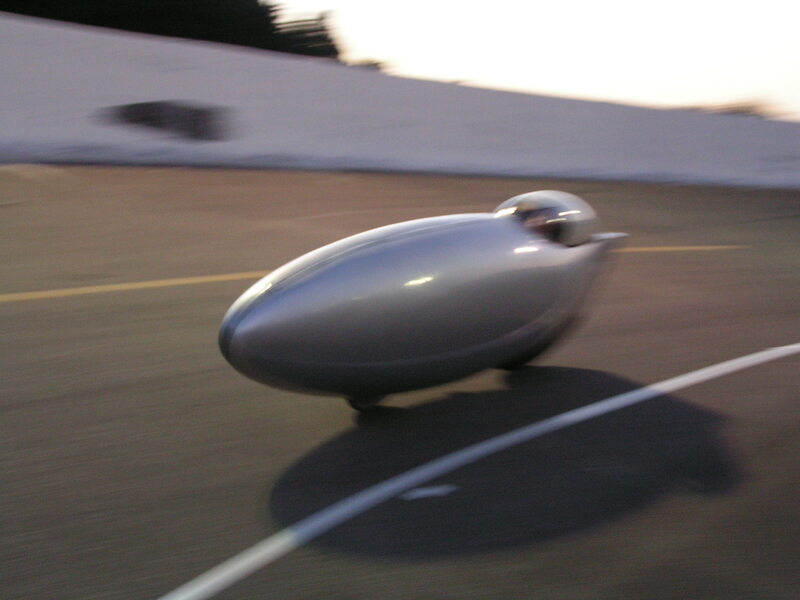 Greg powered his custom made carbon fiber bullet bike "Critical Power" 1046 km in just one day on a race track in Eureka California on July 19, 2006 breaking the existing world record by 26 km. 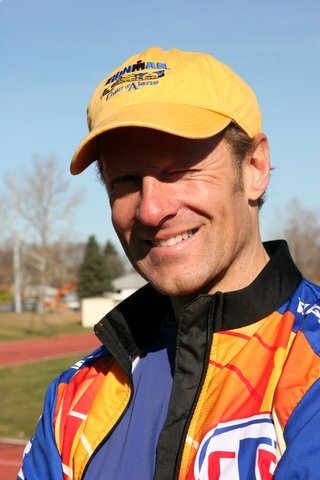 Greg also holds a Guinness world record for the most distance travelled in 24 hours by pedal-powered boat which he accomplished in June, 2007 in Calgary. Greg is an endurance athlete who has finished dozens of marathons, 12 Ironman triathlons and qualified for Ironman World Championships in Kona, Hawaii. Greg is well know by local Calgary elementary and junior high school students. Greg speaks at schools throughout Calgary about his accomplishments, achieving goals and the importance of staying fit and healthy to lead a happy and productive life. His program "KidPower" teaches kids that they can achieve their dreams with focused effort, hard work and discipline. Greg's goal is to eventually expand KidPower to a nation wide program. Greg wants to see our children become active again and is committed to doing his part to make that happen. 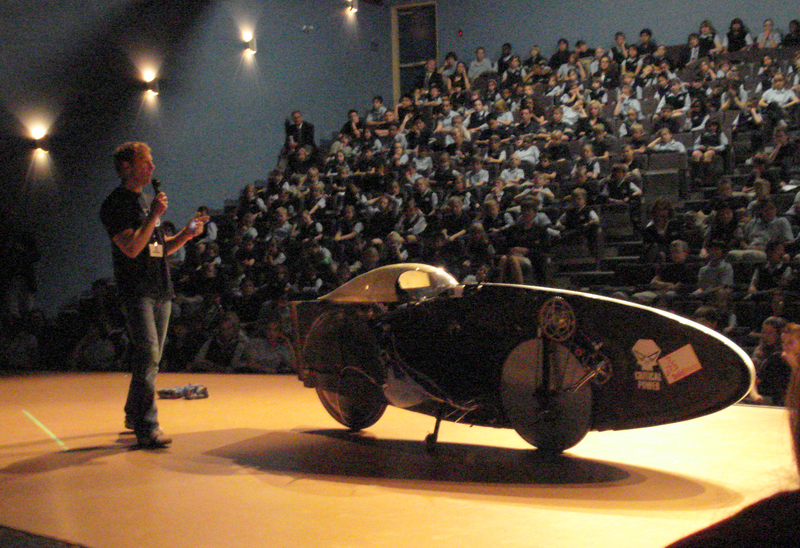 Critical Power' human powered vehicle on the race track in California, where Greg set a 24 hour distance record by travelling 1047 km in 24 hours by human power.